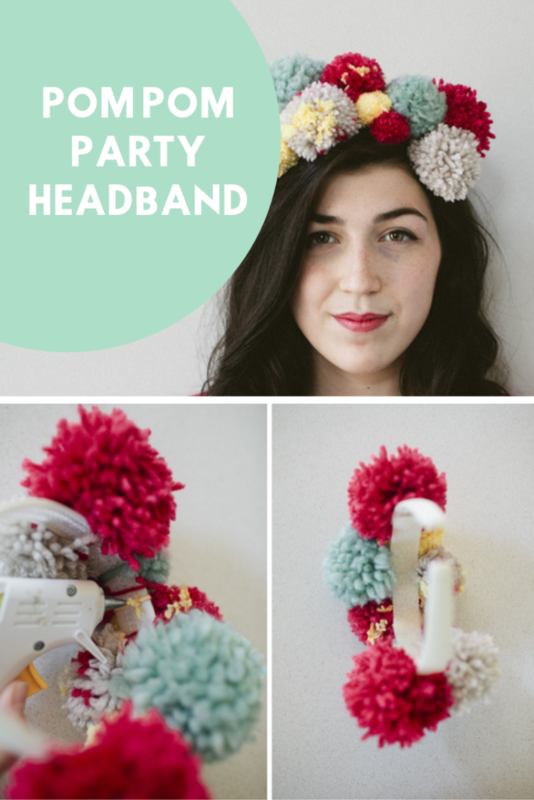 Inside: Party pom headband from DIY yarn pom poms! Welcome to April! (aka party month around this site). With birthdays and spring in full force, April has quickly become my favorite month. We always turn the party meter up a notch this time of year. I am excited to be kicking off a new creative party hat series this month. 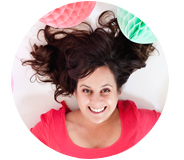 Over the next couple of weeks, we’ll be sharing the juicy how-to details on creating pretty and unique party hats for adults (and some really adorable ones for kids too!). First up, fun with pom-poms… My love for fabric pom-pom bunches goes way back (see here, here and here). 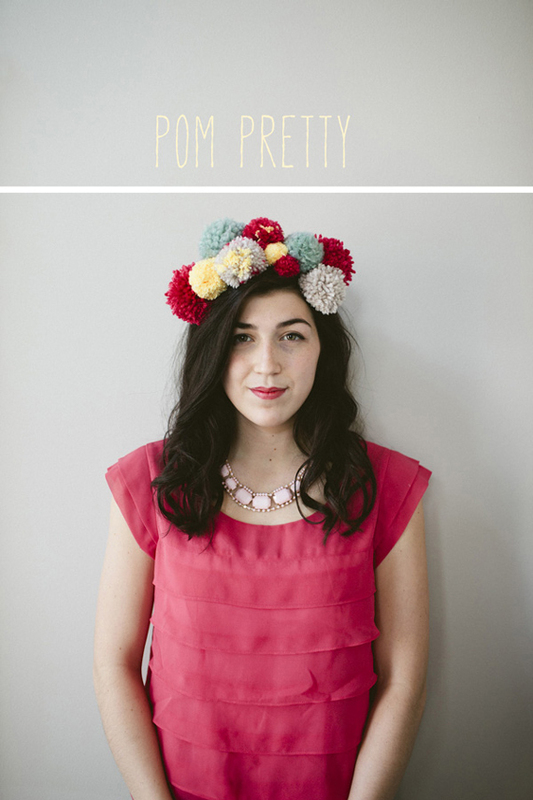 Creating a simple party headband filled with them makes just about the prettiest party hat that I could imagine. This project is one that would be best to do with a group of friends and sport around town in general festive revelry. To make the DIY yarn party pom-poms, wrap a length of yarn around a fork (which gives a tighter pom than using your fingers alone). Wrap the yarn about 50 times to get a nice full pom-pom. 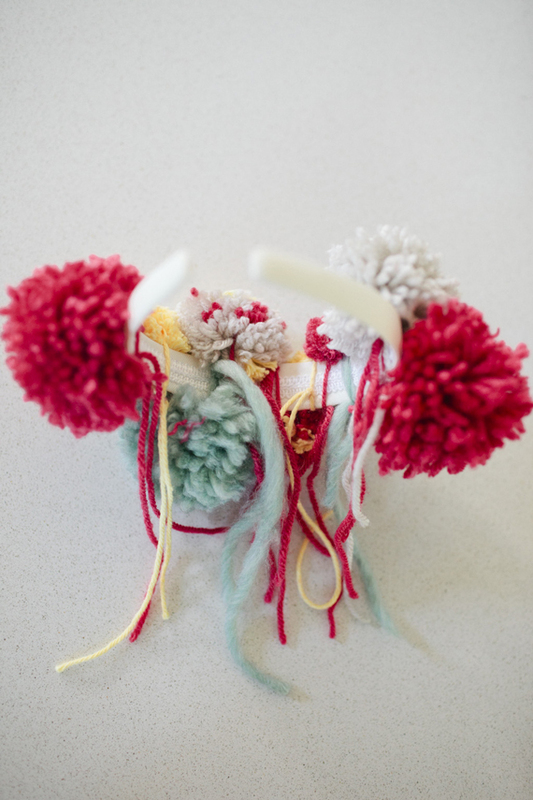 Tie off the wrapped yarn in the center and cut all ends away to create a simple pom-pom. 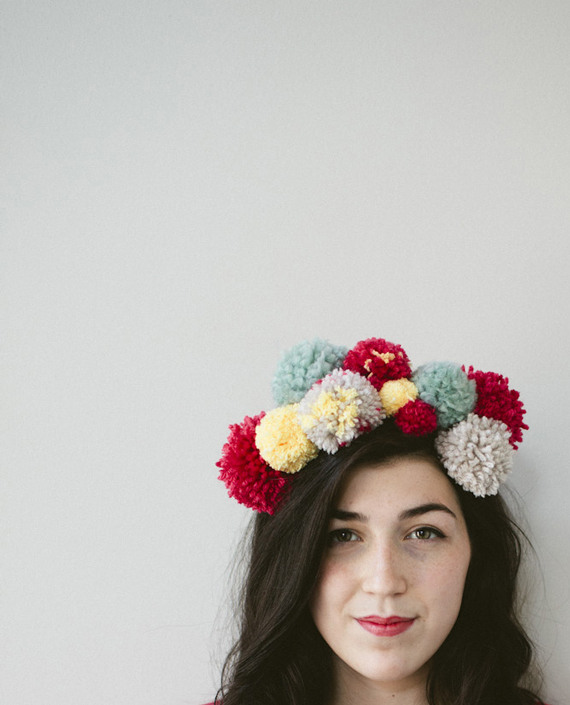 Make a batch of pom-poms in various colors and sizes. Tie the bunches in random formation onto a thick headband. As the pom poms bunches squish together some will naturally move forward, creating a pretty haphazard, layered look. Once all the pom-pom bunches are attached to the headband, cut a small section of felt in a similar color as the headband. Glue the felt along the inside of the headband to hide all the pom-pom bunch ties. Adorn this headband for a party look that is truly special. This post is part one of our creative party hat series. Projects styled and photographed by Carly Taylor under the creative direction of Victoria Hudgins for A Subtle Revelry. Such a fun, colorful addition to a celebration!